Model 4: fieldwork 'tasters' are provided in different syllabus theme locations to give students possible ideas and skills for their own individual investigations. Project proposal forms may be developed during their visit. For Models 1 and 2, the five examinaton boards in England, Wales, and Northern Ireland advise that all full A-level students complete the appropriate component of the course prior to developing an enquiry question and carrying out their fieldwork. That way, there will be more ideas to draw on and more opportunities for the entire class to each develop a truly individual focus. To get the best results from their stay with us, all A-level students should familiarise themselves with our 'pre-arrival' literature at least three weeks before departure to Barcelona. Two weeks prior to departure they should have drafted an enquiry question. One week prior to departure they should have a research plan in place. Students who do not arrive with an enquiry question will still be able to find a focus and carry out research; however, it is less likely to produce a quality outcome if they have not put in appropriate individual preparation beforehand. Model 1 is most likely to produce the best student outcomes, but limits the number of different field studies undertaken. A comparative location on a second day may overload students. Model 2 is more difficult to produce the best student outcomes, particularly given the restricted time available to collect a range of detailed and reliable data. Students need to be thoroughly prepared in advance and arrive having developed their own questions and research methodologies. Students may select from our range of worksheets, for example, but these should have been evaluated and refined before arrival. This may appeal to those schools that have visited us before, and have good experience to draw upon. It could allow groups to shorten a stay, or undertake a wider range of field studies. Model 3 provides the opportunity for a wider range of field studies to be undertaken. This may appeal to those students who enjoy the challenge of independent follow-up work. Model 4, the 'taster' model, makes the most of our range of inspirational field study locations, helps to consolidate an understanding of syllabus themes and enables an exploration of more key concepts (see table below). Teachers bringing a mixed group of AS and A-level students should bear in mind that the AS-level students do not need to spend more than 2 days on their fieldwork enquiry. During the days when the A-level students carry out their own individual research, AS students will need to be fully occupied. If this applies to your group, please bear this in mind and consider a separate AS itinerary as an option for the additional days. How 'individual' does each student's work need to be? involve the individual drawing of conclusions and their communication by means of extended writing and the presentation of relevant data. Every topic must be defined and developed by the student individually, with the teacher 'as coach' and some collaboration with other students may be expected. As long as hypotheses and questions are devised independently, students may have the same or similar titles. Analysis must be carried out independently. Students may collaborate over methodology, sampling and data collection with the teacher in a 'coaching' role. These guidelines are illustrated in the framework below, which shows the relationship between different levels of teacher and student input at various stages in the independent investigation. In practice, for health and safety and other considerations, more direction may be required than expected for data collection (see diagram below). Before coming to Barcelona, students should familiarise themselves with the context of the study, and undertake exploratory qualitative and quantitative research using the WordCloudIt.com (see word cloud image below) and Trip Advisor websites. They should have an enquiry question drafted and a potential research plan in place. 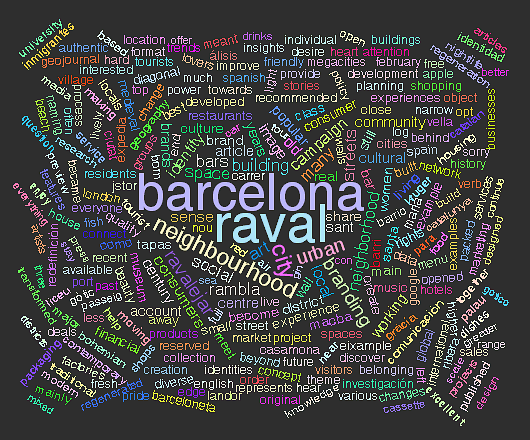 Word Cloud for an "El Raval Place Identity" search from our WordCloudIt.com website. The results are brought from google.com using the top 17 search result websites, fetching 7000 words from the contents. The statistics for this Word Cloud can be downloaded here: Word Cloud Statistics: "El Raval Place Identity"
Day 1 All students collaborate on a pilot study in El Raval exploring 'changing urban identity'. The activities link with several key curriculum themes and concepts including: place identity, rebranding and regeneration, place meaning and representation, globalisation, sustainability and diversity. Students are allowed to incorporate and claim ownership of some of this data from day 1 in their own report providing they can demonstrate that they participated in the design of the methodology and data collection and it was not strongly teacher-directed. For example, they can refine our Day 1 worksheet materials during the pilot study and suggest their own sampling strategies for use on the day. Day 2 Each student now carries out the main body of work for their own investigation. Students should work in groups but must collect their own field data. All students collaborate in follow-up work to develop their own investigations. Those with similar aims can collaborate on sampling and data collection and share data but the teacher can only have a coaching/facilitating role. This is why we advise plenty of preparation work in order to optimise outcomes. How can each student find a different focus? Our open exploratory approach to investigating changing urban identity in The Raval can be a 'springboard' for the investigation of numerous themes and issues, including place identity, rebranding and regeneration, place meaning and representation, globalisation, sustainability and diversity. Each focus in turn offers many possible topics � some will appeal to the most capable students with a high capacity for independent follow-up work (e.g. in their home town as a comparison); others will suit students who will want to complete their primary work in situ in Barcelona. This open exploratory approach is illustrated in the diagram below. What additional support can we provide? A presentation on the Individual Project using Barcelona examples. Group discussions to consider geographical issues and possible questions. Methodologies and sources of information. Design of data collection sheets.